Just got my new cards from VistaPrint. Not quite sure what I think about ’em yet. Even though I designed it myself, I have to see what people’s reaction to them is. I think they may be too “busy” or too hard to read. I was vasilating between blue or black background. Black would have been bold and would have matched the Monarch Mountain’s new website and other marketing materials better, but the blue matches my new jacket. Let me know what you think. 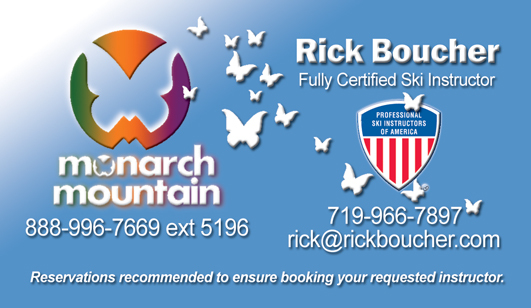 I’m thinking maybe I can help some of our other instructors with their card designs, for a nominal fee of course. We snowsport instructors need to gather as many revenue streams as possible since there’s not all that much money to be made as an instructor. Hopefully the more of these I hand out the more it will help me to get request private bookings. These bookings are some of the best.